The play is based on Germans from Russia living in central North Dakota during the early 1900’s. The comedy was written by two of the actors in the play. 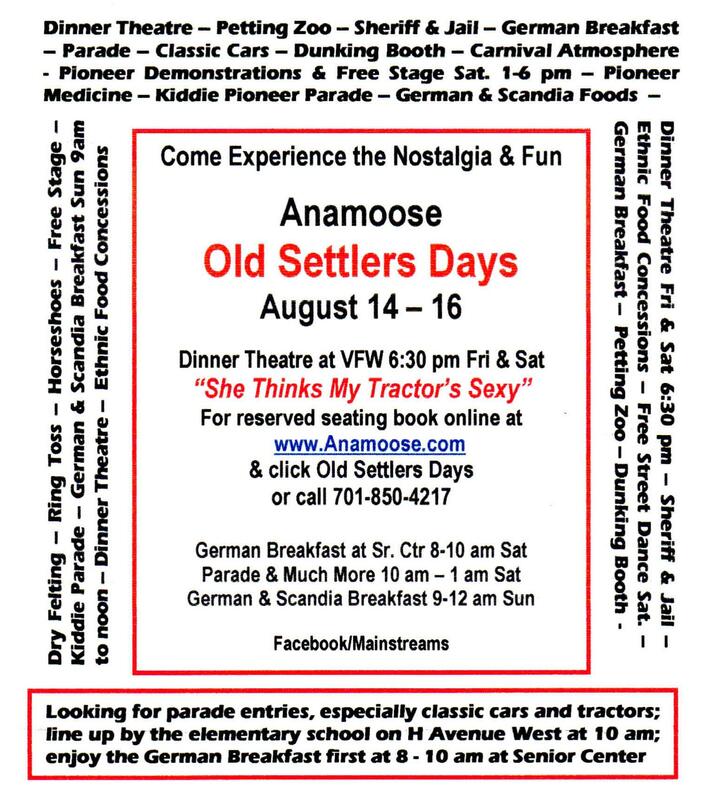 The OSD (Old Settlers Days) Players include LeRoy Becker, Maurie Becker, Bonnie Helm, and Julia Petrovic, all from Anamoose and three of them are AHS alumni; George Helm from Minot and Steve Dockter from Rugby, both of whom are AHS alumni; and Deb Forschen and Julie Muscha from Harvey. Their director is Kim Meckle, an Anamoose-Drake English teacher who has been taking her high school Thespians all the way to State competitions in recent years. After the comedy production there will be vocal entertainment. And on Saturday night, there will be a free Street Dance. $25 per ticket buys the fine dining German dinner, the theatre production, vocal entertainment, and your first libation of beer or wine free. There is limited seating, so it is important to reserve your seats early. You can do that by booking them online at Anamoose.com and then clicking Old Settlers Days, which will take you to the seating chart and instructions to buy your tickets. You may also call 701-850-4217 to buy/reserve your seats. 2 Responses to Anamoose Old Settlers Day!